Please welcome Dr. Bob Sears back to Metropolitan Mama. 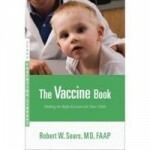 Sears is a nationally known pediatrician, father of three, and author of The Vaccine Book: Making the Right Decision for Your Child. Sears has graciously offered to extend his expertise about vaccines through a bimonthly column where YOU ask the questions…and he answers them. See the bottom of this post for details about how you can submit a question. If you want more information now, you should really just buy his book (read my review here). It’s comprehensive, objective, and the only one of its kind on the market. Today’s question was sent in by Scott of Indiana. ANSWER FROM DR. SEARS: “There is a shortage of the plain Mumps vaccine. No more will be available from the company until early 2009. Some pharmacies that stock and ship single doses of the separate components of the MMR vaccine may still have some plain mumps in stock. Try Hopewell Pharmacy in New Jersey. For more information, see The Vaccine Book: Making the Right Decision for Your Child, or visit www.TheVaccineBook.com. If you have a question about vaccines for Dr. Sears, send an e-mail with “Ask Dr. Sears” in the subject line to stephanie@metropolitanmama.net. for robin h melillo and the note of spring 2009. a year has passed and i hope you’ve been able to make a decision about what to do. any concerns that administering mmr a month or more downline from receiving the measles and rubella would represent over-vaccinating your child is misplaced. the longstanding recommendation is two doses of the trivalent mmr vaccine, both doses administered on or after the first birthday and separated by 28 or more days. the conventional timing of administration at the first and fourth birthdays fits these stipulations, but to deviate so long as you meet the guidelines noted above represents anything but over administration. so quit beating yourself up as you strive to do the best for your child. insuring protection against these illnesses as you’re apparently aware is the primary goal. I just contacted Merks and they mentioned the vaccine will not be available for the next 2 years. Not only have they stopped making mumps vaccine but Measle and rubella as well according to the representative i spoke to. Unfortunately the last shipment was in October 2008 and Merks is saying they will no longer manufactur the individual vaccines due to manufacturing capacity conflict. Merk confirmed the combined MMR does NOT contain thimerosal (ethylmercury preservative) it is still three live vaccines in one and some children with deficient intestinal predispositions may be at risk of the vaccine <<shocking<, their system. My question is , can I protect my child by using live bacteria like Culturel to line her intestin and build her up so to speak to protect her from the virulent effect of the vaccine? millions of kids got the mmr and do not have autism..
What a totally irresponsible answer from Rhonda on April 10th. Not quite sure why she’s even responding to this thread as it doesn’t seem to relate to her. if you just would have given the mmr.. you wouldn’t be in that boat of overvacinating…. Hi..I am totally in the same boat..gave the measles and was just about to give the rubella shot and found out there was no mumps left, called merck and gave them myh feedback and told everyone I knew to also call and complain. I dont know what to do, have the rubella shot sitting in my fridge and dont want to give it until I find the mumps in case I have to give the MMR which was the whole point of avoiding that. I am so frustrated and feel that they gave parents no options and its not right at all!!! I paid out of pocket to get the vaccine separated. I was told that the Mumps would be available in the second quarter of 2009. I gave my 27 month old son the measles in early December 2008 because I was planning a trip to Arizona where there was an out break. In January, I gave the Rubella vaccine in preparation for the Mumps to be available in the next few weeks. I got a call from the pharmacy last week and I was told that Merk is no longer making the Mumps vaccine. This is totally irresponsible of Merk. They should have at least given some warning that they would stop producing the vaccine. In addition it is un-ethical. Now my son may have to get the MMR and as aresult be OVER vaccinated. As parents, consumers and free citizens we should have the power to make the choices that we see fit for our families. I am so upset about this recent development. Please help me to find the Mumps. My ped told me at my dd 12 month check up that the company that makes the MMR vaccine is no longer splitting the shot up into single doses and the only option is for the MMR together now. Is this true? She has celiac disease and I am afraid to give her the MMR. Any thoughts would be appreciated. Thanks for keeping updated post with Dr. Sears. I have this book and still struggle with the vaccination issue. We have not vaccinated our daughter yet. But this new measles outbreak is starting to scare me a bit. Now I’m second guessing myself. Anyone else in the same boat? This is a great part of your blog. I love it! Thanks! I have been learning a ton about vaccines since looking into this and talking with my family and sisters in law about it. I’m so glad that these resources are available. Ooo, this is interesting. Our 2 yr old was supposed to get the mumps vax at her 2yr appointment but the dr said they were out of it at the time. She said just to bring her back when we went for Alexa’s 4 mo appointment and she could get it then. Well, I didn’t take her then b/c my parents were here and I just HAD to take advantage of the free babysitting! I forgot to ask if they had any then or not. Now I wonder if I should just wait or get her the reubella then do the mumps next year. Humm.